Create a carpet of trailing pink flowers in your garden this spring, with the beauty of the aubrieta. A great ground covering perennial, Double Pink will be smothered in flowers in spring and into early summer to create a mass of pretty pink. The plants create mounds of small foliage which can also trail over walls. From April, they'll be covered with masses of flowers, brightening up the garden during the early part of the year before many other plants start to flower. A classic for any outside space, we love this aubrieta. Flowers April-May. Height 11-20cm (4-8"); spread 20-30cm (8-12"). 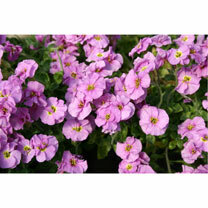 Supplied in 9cm pots. Double Pink - Beautiful ruffled pink flowers. Flowers May-June. Height 20-40cm (8-16"). Supplied in a 9cm pot.